There’s nothing like spending a hot day in a hot kitchen to get you in touch with your Southern roots–and today was hot. But this journey started yesterday–a much milder morning. 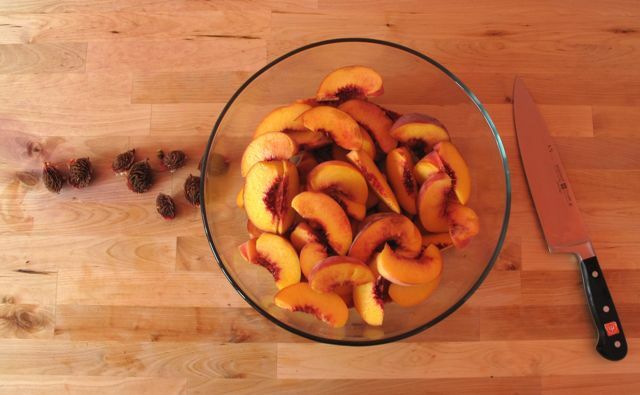 Peach season is at its peak, and if you don’t seize the moment it will pass you by. I had a glorious morning yesterday at the Grand Lake farmers market. 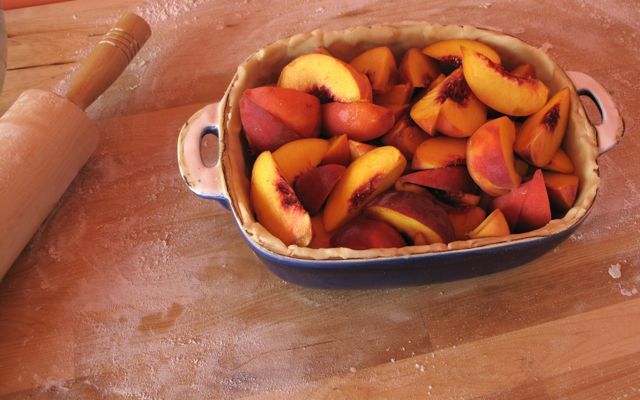 I bought tons of peaches at different levels of ripeness, with the intention of making a series of cobblers over the next few days. 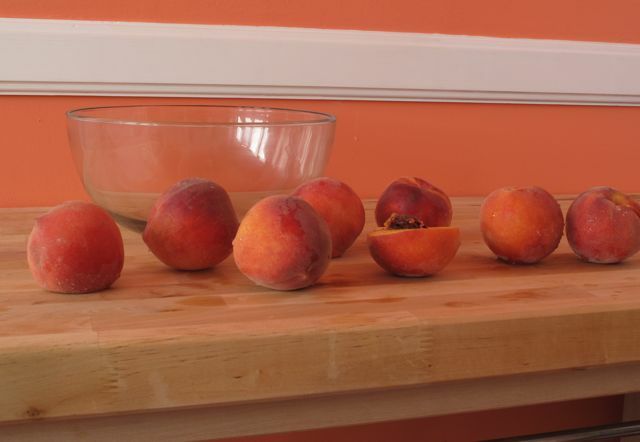 Blossom Bluff Orchard had great, perfectly ripe peaches. I couldn’t decide between O’Henry (slightly tarter) and Summer Lady (slightly sweeter) so I decided to get four of each for the first cobbler. 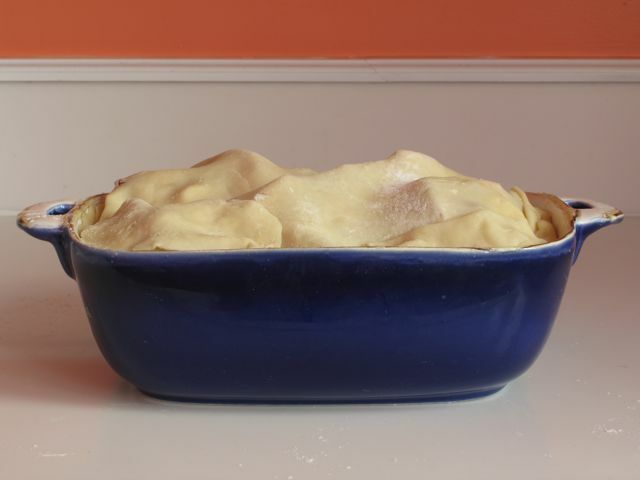 And since I was using Lee Bailey’s recipe, which calls for seven large ripe peaches for a 7″x9″ deep dish, and I only have an 8″x10″ deep dish, I figured eight medium-to-large ripe peaches would serve me well. I got home and started preparing the dough. I always love the neat cone-shaped mountains of flour sifting produces. While I was doing that, I decided to heat up a snack in the microwave. Being at the end of a long line of Southern ladies who typically distrust such kitchen technology as a matter of principal, I made a mistake that only a microwave novice would–I stuck my finger in my food to check if it was hot yet–due to my utter disbelief that it *could* be hot after one minute in this strange contraption. Well, apparently that specious technology has come a long way. My food was hot. So hot that I burned my finger badly. It hurt so badly I had to keep it on ice for a full two hours. I feebly refrigerated the dough with my nine remaining digits with the intention of returning to the project the next day. Today went much better. The burn had settled down, and I had nothing to distract me from my baking other than myself. So I took my time. After some deliberation, I decided to leave the skins on my peaches. 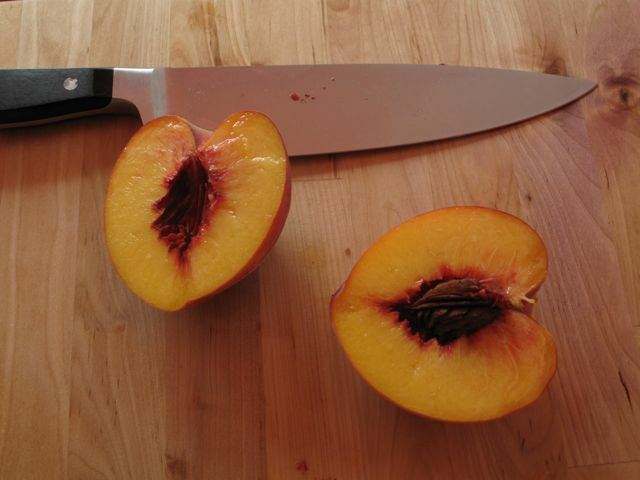 Maybe Bailey would turn in his grave–but I totally missed the line in the ingredients section of the recipe about skinning the peaches. 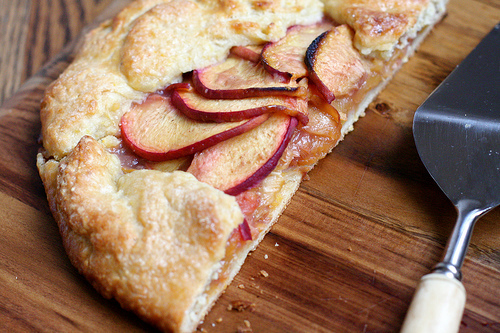 Anyway I like the skin–the flesh of any stone fruit attached to the skin is always my favorite part because it’s usually where the tart-ness lies, which balances all the sweet. The hardest part of this truly simple recipe was rolling out the dough. I just don’t do enough baking to know how to roll out dough very well. Luckily, the recipe didn’t call for a perfect circle, but the rolling still made me anxious. After I reverse-rolled (“window-shade style”) and released the dough over the dish, I knew right away I didn’t have enough. The dough is supposed to spill over the sides while you fill the dish with the fruit, to later be flopped back over on top to cover it. I didn’t panic, I just decided to make more dough. This time a double amount (since I’m planning to make more cobbler soon anyway). I decided I had to eat it for dinner. I hadn’t picked up the vanilla ice cream but I just couldn’t wait. I utterly enjoyed eating this cobbler. 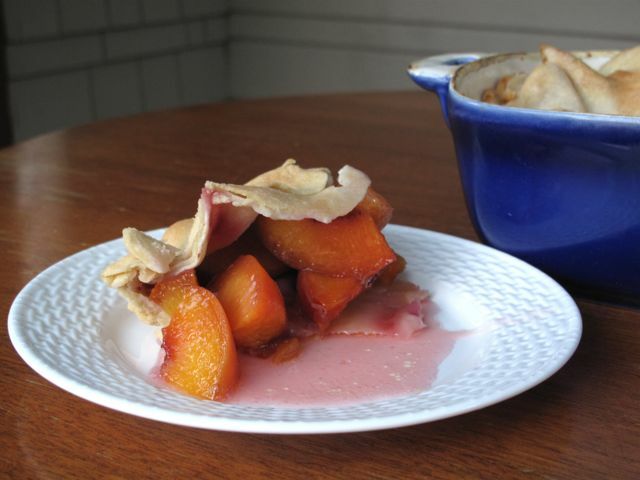 Spooning the first portion was incredibly gratifying–largely because the color that these peaches produced in this recipe is phenomenal. The deep orange and red is perfect, and the liquid produced by the cooking is this gorgeous pink-wine. And the crust–the crust is it. I couldn’t hope for a better one. 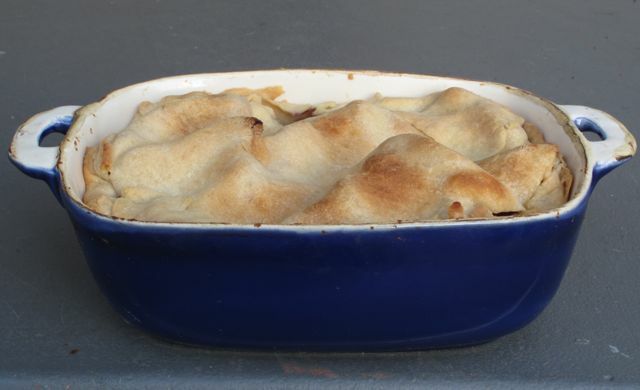 Now it’s my first cobbler of the season and I don’t want to speak too soon, but it was a bit on the sweet side for me. 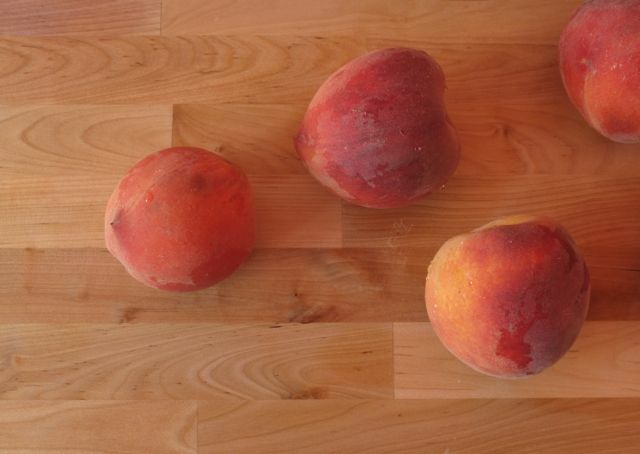 The peaches were perfectly cooked–great balance of firm and soft (and I didn’t think the attached peels detracted), but to be truly critical, the bites with that bit of tart punch which I crave were too few and far between. 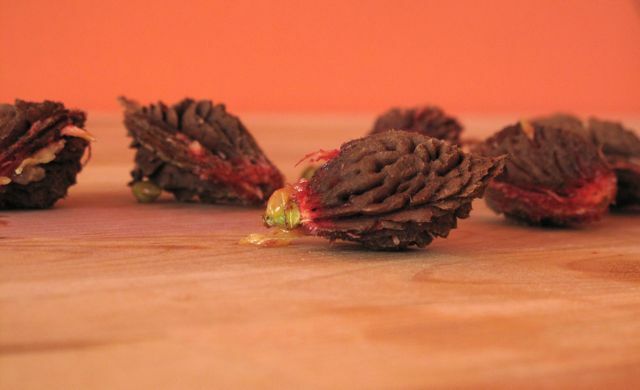 The peaches I used were very sweet to begin with, so if I were using similar fruit I might try to reduce the sugar to a minimum–just enough to create a good syrupy interior–without adding too much sweetness. Perhaps a third of a cup. I’m sure I’ll continue to enjoy eating this one–and in the mean time I’m ready to try another. I think I’ll just have to make both. First you take a nice size mixing bowl and one small bowl. other and letting the white fall into the small bowl. Either keep the white for another more virtuous day or discard. Put only the yolk in the large mixing bowl. Squeeze the lemon and add only the juice (no seeds) to the egg yolk. Add the mustard to the egg and lemon juice. I use Dijon, post-life in France but Eddie used Colman’s powdered mustard [since 1814, but new and improved website with audio] after adding water as directed. Salt and pepper and paprika to taste. Post life in France [the first time this phrase was written I edited it; after having read it twice I left it in], I started adding the garlic at this point. 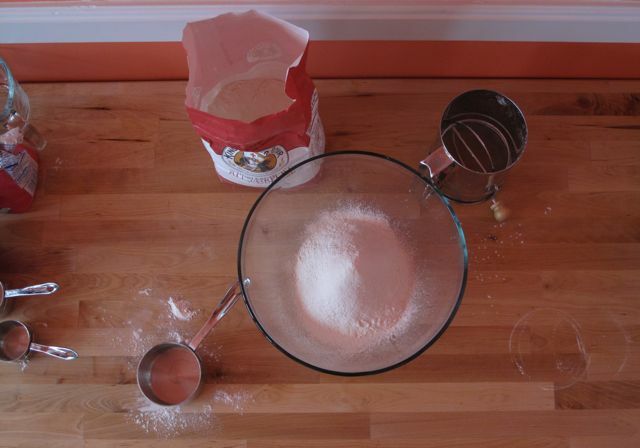 Take a fork or a wire whisk and make an emulsion of the above ingredients. Take a deep breath. This is the crucial step. bind it with the emulsion. You want to stop adding the oil when the mixture reaches saturation. It will not be the consistency of a store-bought mayonaise, but you do want it to come to a peak when you lift the whisk. If you go too far and add too much oil the mixture will separate and you will have a nice dressing but no mayonaise. To quote Elizabeth David “Start again, this time more circumspectly. Sprinkle the mayonaise with paprika. You may serve it directly or cover and chill for later but not terribly much later!